Our growling stomachs reminded us that it's almost 2pm already and we haven't had lunch yet. There's a McDonald's nearby and we could've eaten there if we want to but among our objectives is to experience Cebu's good food first hand. Thus, we're trying out CNT Lechon, located near SM City Cebu. According to the ECP receptionist, from East Capitol Drive, we can take a 06H jeepney to get there. Yes, you read it right, 06H. 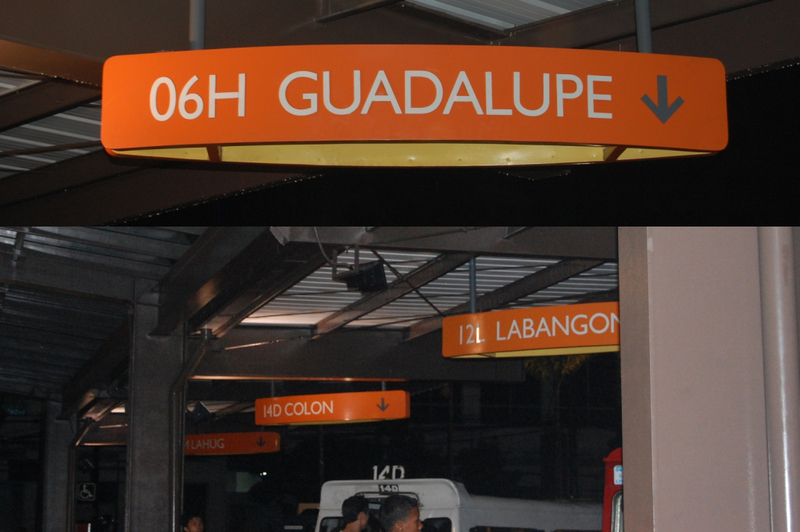 One interesting stuff in Cebu is their public transport system. Jeepneys there use a 3-digit alphanumeric code to stand for their route. Jeepneys in Cebu also aren't your typical Sarao-type. They are multi-cabs (like those shuttle rides in MOA, only bigger) that come in different colors. Too bad I wasn't able to capture them on the road because Jhay kept making saway that I keep the camera for safety purposes. So we hailed a 06H bound for SM Cebu (note: the same route also passes by Ayala Center). The fare is 8:50, which I think is 1 kilometer more than the minimum. Travel time is 10-15 minutes. SM Cebu is nothing different from the SM Malls that we have here. Lots and lots of the province's delicacies at the SM Department Store. We immediately asked around for CNT Lechon and we were directed to go to the supermarket. I was skeptical but we went anyway and when we saw the tiny store, I knew it wasn't what my travel guides were talking about. Jhay was considering to just order and eat it somewhere else but I insisted we ask one more time if there's any other CNT Lechon in the area. Just when we're about to give up, this one lady guard became a guiding star. She gave Jhay some instructions and much to our delight, we found what we're looking for! Tip #1: If you're going to the restaurant via the same 06H jeep, don't get too excited at the first sight of SM Cebu. Get off when you see CIFC building (top photo) -- that's in front of the second main entrance of the mall. 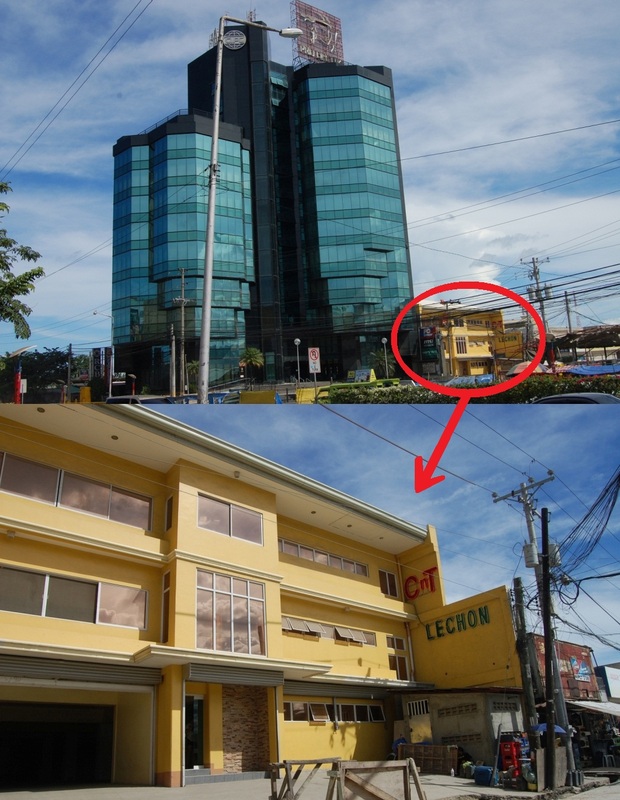 Beside it is a yellow building that is CNT Lechon. Lots of seats for the dining public. We ordered 1/2 kilo lechon (Php 180, their store in the supermarket sells a kilo for 400+), 1 order of chopsuey (Php 40), 3 cups of rice (Php 12 each) and a 500ml bottle of Pepsi (Php 30) for a total of Php 286. So sulit! As expected, the meat is very tender and the skin perfectly crispy! Note that CNT does not have the usual lechon sauce but they provide a dip which is (I think) a mixture of soy sauce and vinegar. For me, it's very flavorful on its own so there really isn't a need for dips and sauces. However, it gets kinda salty towards the end but I guess we just ate a little too much. Hahaha. It was an artery-clogging meal but it's not everyday that we get to experience authentic Cebu Lechon so it's worth it. So when you visit the Queen City of the South, CNT Lechon is definitely a must-try!